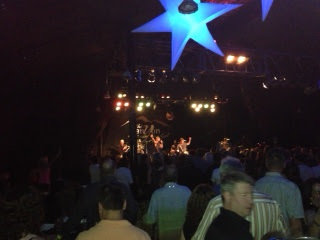 Tonight after dinner I went to see English Beat. They are one of my favorite 80’s bands. If you are not familiar with them, they are most famous for Mirror in the Bathroom, which happens to be the song they closed with. This is not one of my favorites of their songs, but it is very catchy. It was a fun night, especially considering the rest of my day. The picture featured above is of the concert (terrible picture, I know), but I will have more pictures on Wordless Wednesday this week. I am not going to lie… the rest of the pictures are just as bad, if not worse, so don’t get your hopes up too much. In fact they are just of my purse sitting on the table. Very exciting, I know. Despite the way the picture looks, I actually had really good seats. I just spent the whole night hiding out. I guess I was just feeling anti-social? Is that even a thing?